Well, a preschooler really. But let’s ignore that particular Inconvenient Truth. So, we went back to Beanies, Croydon today. Last time I visited, it was with a 3-week-old baby and no Reuben. It was lovely and mellow and peaceful. This time, the 3-week-old had turned into a 6-month-old and I had the 40-month-old in tow as well. And it was half-term. Not quite so mellow and peaceful then! First off, I need to get one thing crystal-clear. There are still no lifts at Vauxhall. Still just a big corridor. And the posters declaring that lifts are coming in “Summer 2012” have conveniently disappeared. Maybe because Summer 2012 never materialised, the lifts never needed to materialise either. So it was the old haul-buggy-up-steps-while-Reuben-trails-behind routine, until some nice lady took pity on us. I considered going buggy-free, but was pretty sure that Roo would need a nap at some point, and I didn’t fancy carrying him and Eva and the changing stuff. I considered not taking so much changing stuff, but that would have been a mistake too. More on that later. It’s quite annoying, this whole Vauxhall situation. It would be a really handy link to nice places in the Surrey-direction (Richmond, Hampton Court etc) but it’s a huge faff to do it solo. Are you listening SWT?? It’s not just the steps up to the platform, it’s the huge gap getting on and off the train. Sort it out, SWT. Assuming someone is listening, that is. But we got there. Clapham Junction has these magical things that go up and down between platforms and East Croydon has these not-so-magical Big Ramps. Both work. So we got there without any more awkward flights of stairs. And Roo was fascinated by this magical train that ran down the middle of the street. A roadtrain, if you will. Roo’s Mummy was fascinated by the closure of the Last Allders Standing. I wonder when they’ll close the Wimpey? Anyway, onto Beanies itself. 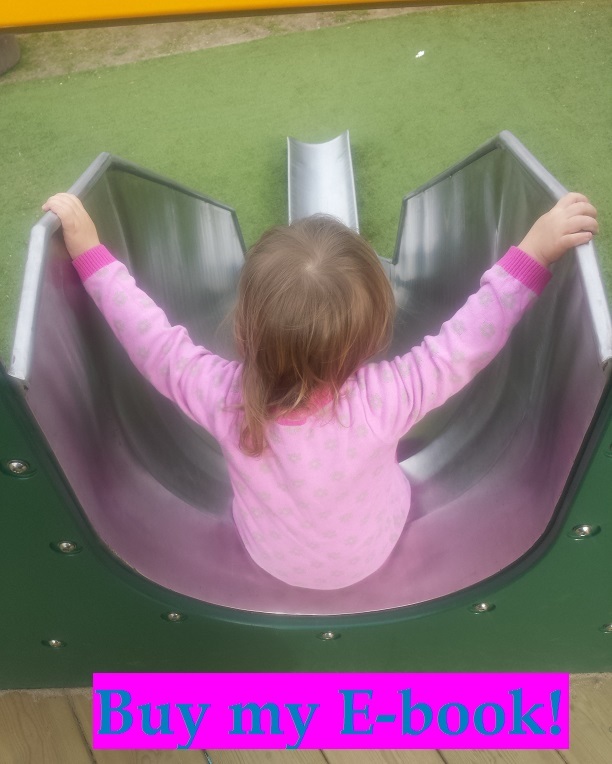 How did the play floor stand up to the challenge of a child who actually wanted to play, rather than a 21-day-old blob? Not bad. I was surprised to see that the entrance fee for over 18-monthers was a fiver. That’s more than the Central(er) London soft plays, and for much less in the way of facilities. 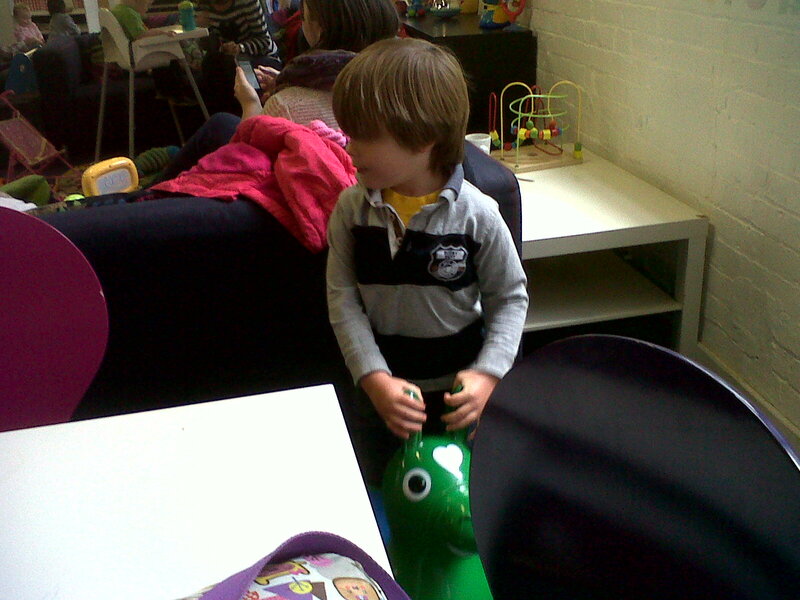 The toys weren’t bad at all, but they were on par with Battersea Park one o’clock club, and that’s free. I’m happy to pay a charge, but £5 for non-members is steep for what it is. 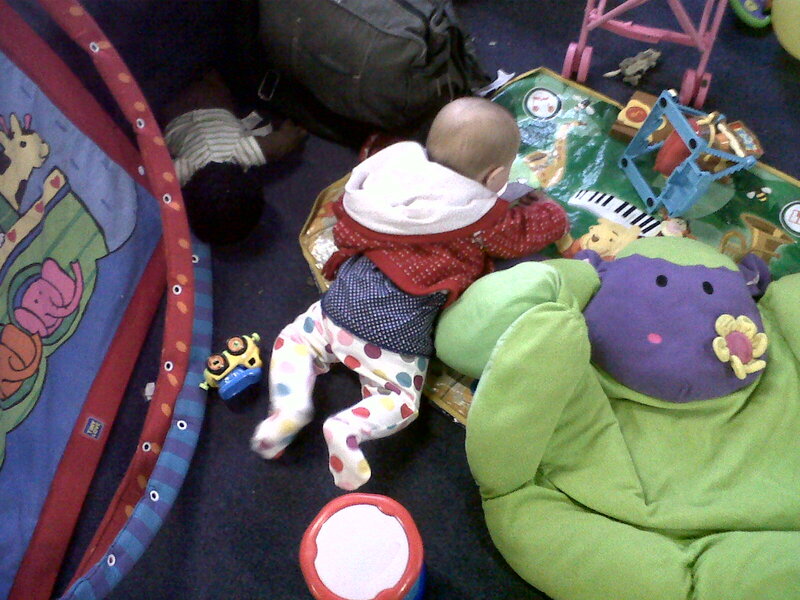 Eva and her baby pal Oscar were happily both free, so I can mentally divide that fiver by two. 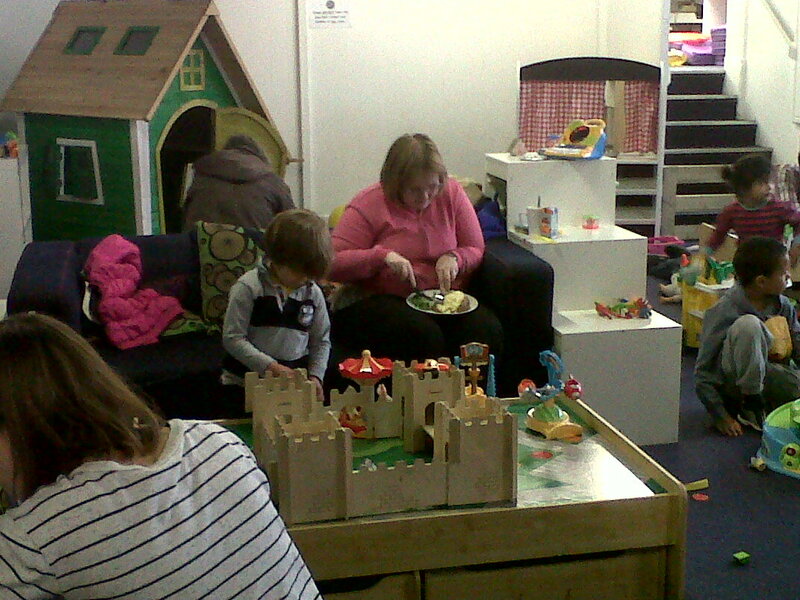 The big advantage of Beanies is that it’s a cafe first, so has quite an extensive menu and a lot of options for kids. The food isn’t amazing, but it’s perfectly nice and they bring it to you on the playfloor. The disadvantage is that there are yet more stairs, so you can’t access the playfloor with a buggy. This wasn’t a problem for us cause we parked it downstairs and Roo walked up the stairs. But Oscar was asleep in his buggy when he turned up, so we had to take food back downstairs. 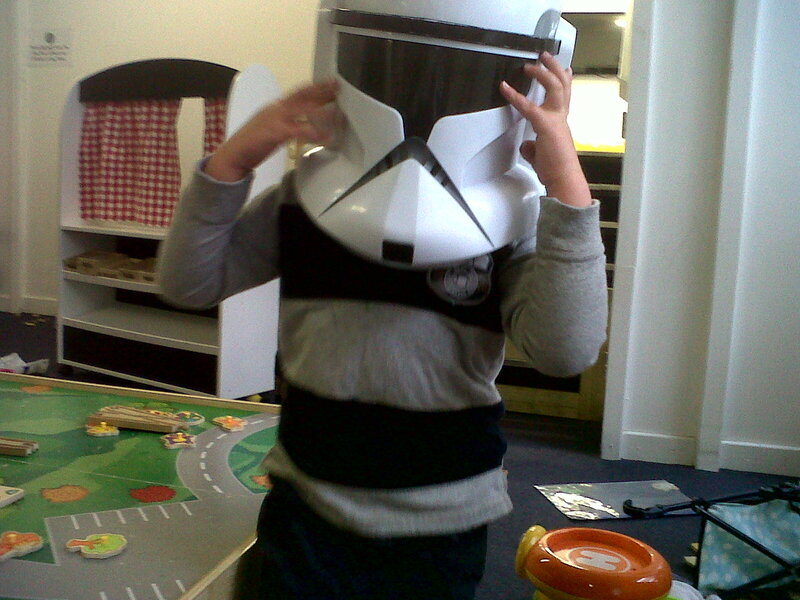 Luckily, Roo was hungry and able to be tempted away from his Stormtrooper mask (see top) for some food. Then he sat in the cafe downstairs and ate for a few minutes before getting bored and wandering off to stack some bumbos. That’s not bad for him. Eva grizzled and grabbed bits out of my salad before dropping them on the floor and grizzling again. If I’d been in a generous mood, I would have put her in one of the many highchairs with her own “picking plate” of little nibbly bits (you can pick and mix your own). I wasn’t feeling generous, for a few reasons. But I might be next time we go! Of course, peace never lasts for long. Roo had gone to investigate the little shops next to the cafe (two clothes shops, one toy shop) and came staggering back, doing his John Wayne walk. Something had gone wrong. Something in the toilet training department. Not sure how that happened, as he’d already used the teeny child-size loos upstairs. But apparently a carton of apple juice can go through a boy quickly. I got him to the downstairs toilets quickly enough to avoid any mess, and they had a cute sea-creature themed toilet seat to entice him to…err….finish his business. So, points for having toilets everywhere. And sorry if we made any mess. I don’t think we did. Back upstairs after lunch, and it was Eva’s turn to have an explosion in the bottom area. We were rapidly getting through our spare clothes, but again we got to try out the changing facilities. Eva liked the mobile above the changing mat. It even stopped her wriggling for a few minutes. Meanwhile, Roo was getting himself into trouble in other ways. An irate mother came over while I was feeding Eva and said that she’d had to shout at my son. Never a good start. He’d been trapping her little girl’s fingers in the window of the play house. Still not good. He hadn’t seemed repentant. OK, bad enough to require action. I went over to the the play house, dragged Roo out and asked him to apologise, which he did. He also said it was an accident. The other mother said it wasn’t. I have to admit I was confused by all this (and poor Eva was confused in the long break in her feed). I would never think that Roo was an angel, but he’s rarely violent or malicious. Boisterous, yes. Snatchy when it comes to toys, yes. But not mean. I went to talk to the older boy that had been sharing the play house to see if he could shed any light on this. He said that they’d been playing “big bad wolf” and the little girl had been trying to blow their house down. So Roo fought her off. I’m sure it all makes sense in his tiny mind. Anyway, we had a small talk about how to treat little girls and how we shouldn’t hurt them even if they’re trying to blow our houses down. Order was resumed. I say order, I mean he went and played in the gated-off bit with children who were more his size. So they were bashing each other with cushions, but that’s OK because they all agreed to it. I think. I didn’t get them to sign anything. Meanwhile, Eva played peacefully in the baby-doughnut, with Oscar next to her on the sheep-shaped blanket. They were happy until Roo came and started piling all the toys into the doughnut, saying “I’m collecting my stuff”. Honestly, that boy should not be allowed near babies. Whoops! Then he put the doughnut on his head and charged repeatedly into Oscar’s Mum. It was time to go. We paid for our food on the way out (must remember to do this!) and Roo begged some carrot cake off me. Turns out it was a pretty crumbly carrot cake, which got us some funny looks as we walked back up towards East Croydon. Or it may have been the strawberry-headed baby sticking out of my coat. Folks outside London do tend to stare at that. Both children were asleep by the time we got onto the train and I had a lovely quiet sit-down, feeling glad that I’d brought the buggy along after all. VERDICT: A nice place to spend a lunchtime and an afternoon. Be careful that your child doesn’t tread on the smaller ones. This entry was posted in Cake and the finest wines known to humanity (eating out) and tagged cafes, cake, choo-choo!, coffee, South London, toys. Bookmark the permalink. A useful article if I am ever in Croydon.